Fantastic fully equipped apartment, located in an old recently rehabilitated embankment, in the historic core of Cerler. * The apartment has three bedrooms, two of them with double bed and one single, the latter with extra bed. * It has all the necessary accessories for a pleasant stay, bedding, tablecloths, and endless details designed only for your relaxation. * In the fully equipped kitchen we find dishwasher, washing machine, fridge with freezer, ceramic hob, oven, toaster, coffee maker, microwave, iron. * Its spacious living room has a television with DVD. * It has a bathroom and a toilet, the latter is inside one of the double bedrooms. * Linen and towels included. Cerler: The village of Cerler, belonging to the Villa de Benasque, existed long before the ski slopes. It appears cited in the ninth century, but there is very little documentation. This town has many noble houses of the sixteenth century, and even earlier. With the creation of the ski slopes of Cerler, in 1970 (at 1. 500 m, the highest village of the Aragonese Pyrenees), its slopes are the best, and they have modern facilities with artificial innovation and ski slopes among pines, with the trail of the Gallinero of 2. 700 m and a difference of 900 m. There are also the ski slopes in the background, located in the Llanos del Hospital de Benasque, all embraced by a landscape of unparalleled beauty. Without breaking the urban structure, high quality accommodation has been built. On the road that goes to Cerler there is a nice viewpoint, where you can see Benasque, Eriste and its adjoining valleys. The town of Cerler has a church of the sixteenth century. Posets-Maladeta Natural Park: Declared a Park in 1994, with an extension of 33. 267 ha. with the purpose of safeguarding its natural values, vegetation, flora and geomorphological formations. The thirteen glaciers stand out as natural monuments, with about 350 ha. in the massif Posets, Perdiguero and Maladeta. The park hosts the largest number of summits that exceed 3,000 m., Nature has been prodigal in beauties and altitudes. Distributed by the Valley there are more than 95 lakes of glacial origin (Cregüeña, Batisiellles, etc. ), of different dimensions and characteristics, with multiple waterfalls. The best way to see all the summits of the Park, from the Aneto to the Posets, is using the chairlift that leaves the Ampriu, a place that is reached through the narrow asphalt road that starts from the town of Cerler. In Benasque there is the Visitor Center, with a permanent exhibition that includes the four great environments that exist in the Park: rock, ice and snow; pasture and meadow. The Valley of Benasque: The Valley of Benasque is capable of captivating and achieving a happy stay among us to any passer-by or traveler who dares to discover it; emphasizing its customs, its folklore, its architecture, the gastronomy and of course, its surroundings. Benasque and all its surroundings have known in recent decades the rebirth of a new culture, based above all on the provision of services, tourism. Tourist focus of first order in Aragon, hosts the largest number of summits that exceed three thousand meters of altitude. The Villa de Benasque, head of the valley, located at 1. 138 m altitude. Whose population is estimated at about 1,700 registered in the municipality (Benasque, Cerler and Anciles). The inaccessibility has helped to preserve their dialect, "El Patués", a language that has influences, for its proximity, French, Catalan and in any case Latin. This dialect, which is currently spoken, was in time the form of communication and currently, in study and conservation. Los propietarios son muy atentos y te facilitan lo que puedas necesitar; la casa tiene 3 dormitorios independientes del salón y baño completo y aseo, lo que en nuestro caso, que éramos todos adultos, era fundamental para estar cómodos y organizarnos. Parfait. Vous ne serez pas déçus !! Appartement situé dans le quartier ancien de Cerler. Prestations de qualité, bien entretenu, joliment décoré, équipé avec goût, spacieux pour 6 personnes ( dont 2 adolescents) , literie confortable, nombreux ustensiles de cuisine, paisible et propice au repos. Rien de manque. Vue splendide sur les montagnes. Environnement calme et pittoresque. Un havre de paix. Hôtes très réactifs et disponibles. Très bon accueil. Très bons restaurants recommandés par les propriétaires à deux pas. Nous espérons revenir dès que possible. La station de Cerler vaut le détour et l'ambiance est au rendez-vous. En résumé, nous sommes enchantés. A très bientôt, j'espère. Somos una familia con 2 hijos adolescentes. Sin duda el mejor alojamiento jamás concertado, no tengo un "pero" que añadir, todo lo contrario: emplazamiento, vistas, comodidades, limpieza, amabilidad, disponibilidad... el entorno increíble, nos hemos sentido y nos han hecho sentir como en casa. Para recomendar totalmente!! Desde aquí un abrazo a la familia, y a la abuela que nos cogía el pan. Muchas gracias. Para nosotros también ha sido un placer teneros como huéspedes. Somos una familia de cuatro de tarragona, el apartamento nos a parecido perfecto, es amplio, limpio, confortable...no le falta de nada, y las noches en el más absoluto silencio. Agradecer el trato recibido al realizar la reserva con tan poco margen. Es un piso muy confortable y amplio. Es luminoso y está situado en el centro del pueblo por lo que tiene un encanto especial. Está bien equipado, no le falta nada y todo está muy bien ordenado. Estuvimos muy a gusto y pensamos repetir. Pilar, estamos encantados con que hayáis pasado una buena semana. Estamos aquí para cuando queráis. Un abrazo. The town of Cerler, in the Benasque valley. It is located at an altitude of 1,540 m, has many noble houses of the sixteenth century, and even some of previous eras. Its location on the valley makes it have spectacular views of it. It also has wonderful meadows, which facilitate the practice of activities related to the mountain, not forgetting the ski resort of Cerler. The ski resort has modern facilities with artificial innovation and ski slopes among pine trees, you can also enjoy the trail of the Gallinero of 2. 700 m and with a difference of 900 m.
Ski: Cerler is the highest alpine ski resort in the Aragonese Pyrenees. 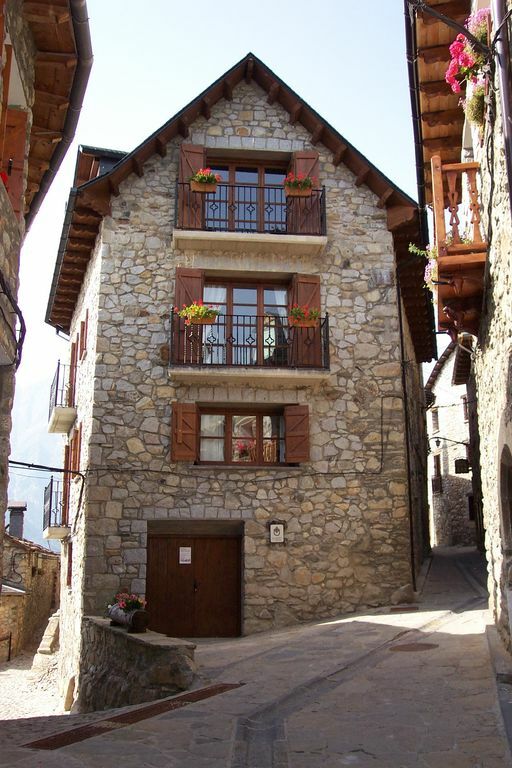 It is located in the heart of the Benasque Valley, surrounded by pine forests and 60 peaks over 3000 m, including the Aneto, roof of the Pyrenees. It has one of the highest skiable slopes in the whole mountain range, oscillating between the 1500 meters of the base and the 2700 meters of the Pico Gallinero. The majority of the station is between 1900 and 2700 m.